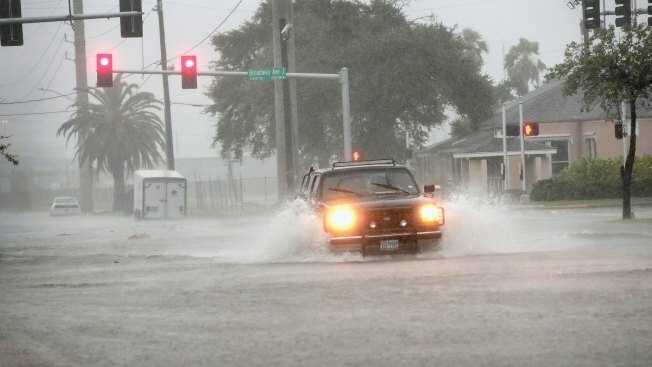 A vehicle navigates a street flooded by rain from Hurricane Harvey on August 26, 2017 in Galveston, Texas. The Galveston County Daily News reports that January is normally a slow month for hotel bookings in the county but many say they're at capacity. The Federal Emergency Management Agency offers transitional housing for people displaced by natural disasters, and hotels choose whether to accept FEMA vouchers that pay about $100 a night in the Texas coastal region. It wasn't immediately clear how many people displaced by Harvey in other nearby counties were staying in hotels. Harvey made landfall Aug. 25 northeast of Corpus Christi, bringing with it days of heavy rain across a broad area of Texas.